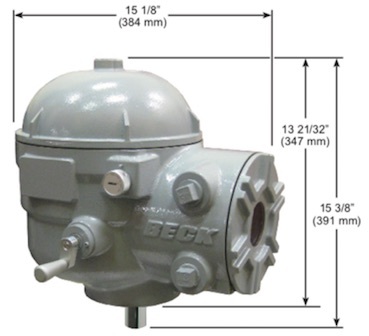 Beck actuators are the ideal solution for industrial valve control. They provide excellent control — positioning accurately to 0.1 degree — and solve the problems inherent to all other actuator technologies including traditional electric actuators, pneumatic actuators and hydraulic actuators. Beck actuators require virtually no maintenance and they position consistently over time and regardless of load. They require a minimum of power to operate and there are no duty limitations to worry about because Beck actuators will not overheat or burn-out. All Beck actuators are capable of continuous duty with no modulation or runtime limitations, operating 24/7 regardless of service. If you need an actuator to modulate, or simply open and close a valve, a Beck actuator will perform year-after- year. • Space efficient packaging making it easier to fit on valves in any orientation. If you have valve application requirements, contact a Beck sales or application engineer for more information. Whether your need is low voltage, hazardous rating, or fast speed, Beck can help. We strive to provide the unmatched control and reliability that you’ve come to expect from Beck.